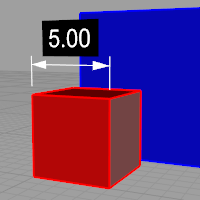 Dimension commands create dimensions that annotate length, angle, radius, etc. at the elevation of the input objects. 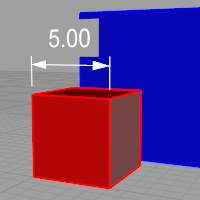 Dimensions are attached to the object by History. The Centermark command draws a cross or a cross and center lines at the center point of a curve. The size and style of the centermark are controlled by the Annotation style and the Centermark properties. Dimensions have History recorded by default. The default History recording behavior is controlled by the RecordAnnotationHistory option in the History command. 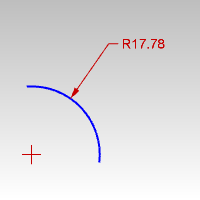 The size of the centermark for radius and diameter dimensions. A cross mark is drawn at the center of the radius or diameter. A cross mark and lines that extend to just beyond the edges of the object. The Dim command draws horizontal or vertical linear dimensions. Pick the third point to locate the dimension line. When the dimension text does not fit between the extension lines, you can place the dimension text on left or right. 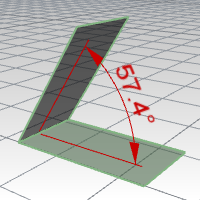 Linear dimension line and text stick to their locations when the object is moved. If you need to relocate the linear dimension line and text with the object, they have to be moved together. Select the annotation style name. Select an object to dimension. 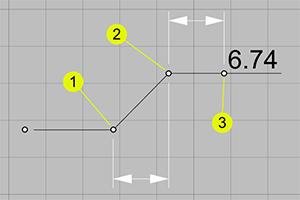 Add more (chain) dimensions along the same dimension line. Continues dimensioning from the first point. Draws the dimension aligned with the construction plane y axis. Draws the dimension aligned with the construction plane x axis. Dimensions apply settings from annotation styles. If you need a dimension to look different than its annotation style, you can override settings in the dimension properties. Select the dimension, and in the Properties panel, click the Dimension button to edit dimension properties. Double-click the dimension to open the Edit Dimension dialog box. The settings different from the annotation style will be highlighted in blue. The DimAligned command draws a linear dimension lined up with two points. The DimAngle command dimensions the angle of an arc, or between two selected lines, or from three points. 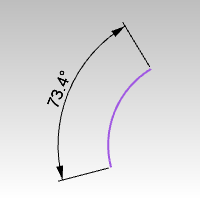 Select two lines, polyline segments, linear surface, or polysurface edges. 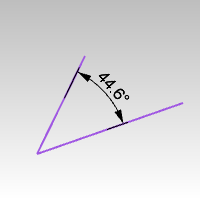 Pick the apex of the angle (1) and then the dimension points (2) and (3). The DimArea command dimensions the area of closed planar curves, surfaces, polysurfaces, meshes, or hatches. 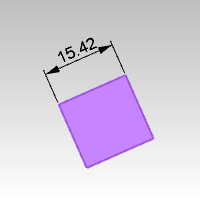 Select a closed curve, surface, polysurface, sub-surface, mesh, or hatch. Pick a start point for the text or leader. If the Leader option is used, continue to draw leader points as for the Leader command. The area of the object is automatically entered. Uses a leader to point to the object. Places the text at the picked location. The dimension uses a text field for calculating the dimension. Select the dimension, and in the Properties panel, click the Leader button to access overrides to the style and text content settings. Double-click the dimension to open the Edit Leader dialog box. The DimCurveLength command dimensions the length of a curve. 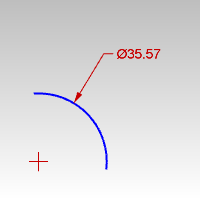 The length of the curve is automatically entered. 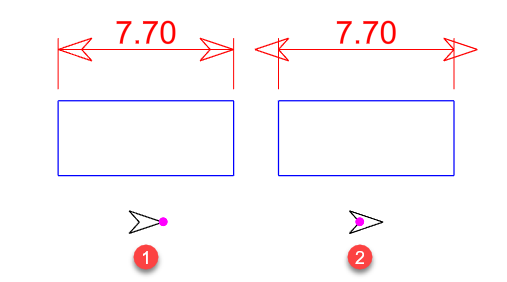 The DimCreaseAngle command dimensions the angle between two planes. Pick a location for the dimension. The DimDiameter command dimensions the diameter of a selected curve. Dimensions always measure as though the object were projected to the current construction plane. The DimOrdinate command dimensions the x or y distance from a base location. 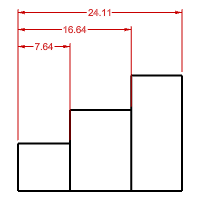 Ordinate dimensions show the horizontal or vertical distance from an origin point (called the basepoint) to a dimensioned feature, such as a hole Center or a feature in a part. The DimOrdinate command annotates the absolute distance in the X or Y axis between two points. It is always positive and different from vectors that may be negative. Ordinate dimensions are widely used in CNC related manufacturing industries because the clutter caused by dimensions is minimized. This type of dimension prevents accumulated errors by showing the X or Y offset of the feature from the basepoint. The shape of the ordinate leader can be point edited after creation to avoid overlapping geometry. An XDatum dimension is implied if your second pick is primarily above or below the first pick. A YDatum dimension is implied if your second pick is primarily left or right from the first pick. Press Enter when finished placing dimensions. 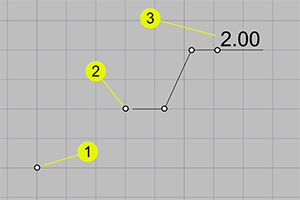 Move the base point (1) or dimension point (2) to a new location. Dimension text (3) will update if History was recorded. Overrides the implied biasing and forces an X ordinate dimension. Overrides the implied biasing and forces a Y ordinate dimension. Changes the basepoint for the duration of the command. The basepoint reverts to the default construction plane origin when the DimOrdinate command is run again. Decides the offset distance of the two kinks (1) (2) before the leader endpoint (3). This option appears after the first point is picked. The DimRadius command dimensions the radius of an arc or circle. Pick a point on the curve where the dimension arrow will start. The DimRotated command draws a linear dimension that is rotated from the xy axis. Enter a number to set the rotation angle of the dimension line. 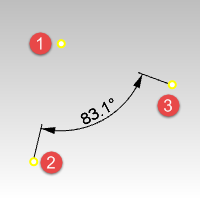 The rotation angle can also be set by picking two points. The DimRecenterText command returns dimension text to its default location. To move dimension text away from the dimension line, turn on the dimension control points and drag the text control point. List the annotation styles available in the model. If an annotation has any settings in its properties different from its style, a menu behind the style name appears. Resets all the changed settings to the style defaults. Applies the changed settings to the annotation style. Use the settings in the properties to create a new style. Click to open the Annotations page for the style of the selected leader. Surrounds text with an opaque color. Sets the mask color to the viewport background color. Select the mask color using the Select Color dialog box. When Mask is set to Solid Color, click to change the color. The width of the blank area around the text. The display size is a product of the component's size (like arrow size or text height) and the Model space scale value. Normally this is the inverse of the print scale. The text height, extension line extension, extension line offset distance, and arrow length are multiplied by this number. Tip: Click to open the drop-down list, and type the initial letter of a font to find the font quickly. Sets the font style to bold. Sets the font style to italic. Sets the font style to underlined. Text fields are formulas that are evaluated while Rhino is running and the result is displayed in the text. All text fields are in the syntax of %<field and options>%. When a formula cannot be evaluated an error string of #### is displayed. If a text field displays a long text string, such as a long file path, the text string will not wrap. The toggle stacking brackets button is a shortcut to add or remove [[...]] around text selected in the edit box. Stacking brackets will make the text between them stack, so that [[1/2]] will display as a stacked fraction. Enters a degree symbol (°) into the text. Enters a radius symbol (R) into the text. Enters a diameter symbol (Ø) into the text. Enters a plus/minus symbol (±) into the text. The angle brackets < > represent the dimension value. You can type additional text before or after the angle brackets, or you can eliminate the angle brackets. To type multi-line text, press and hold Alt and press Enter. Select an annotation to apply its properties to the current annotation. When there is not enough space for the arrows, you can force their position. Automatically determines where to place the arrows. Forces the arrows to the inside of the dimension lines. Forces the arrows to the outside of the dimension lines. Automatically determines where to place the text. Forces the text to the inside of the dimension lines. Forces the text to the outside and to the right of the dimension lines. Forces the text to the outside and to the left of the dimension lines. HintLeft and HintRight are automatically selected based on where you pick to place the dimension line. Picking on the left, HintLeft is selected. Picking on the right, HintRight is selected. When the dimension is changed, and the dimension text no longer fits between the extension lines, the dimension text will be moved to the left or right side. Use a previously defined block as an arrowhead. This option is not available when no blocks exist in the model. Create a block from the geometry. (1) The base point of the arrowhead block is placed at the tip of the arrowhead curve. The dimension line passes the arrowhead. (2) The base point of the arrowhead block is placed at the end of the arrowhead curve. The dimension line does not pass the arrowhead. If you want the tip of the arrowhead to be accurately placed at a location, be sure to place the base point of the arrowhead block at the tip. Make use of the By object, By layer, and By parent features of the Block command to control the appearance of the arrow. The length of the arrowhead from tip to tail. The units and formats of the annotation style. 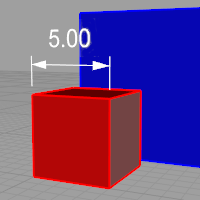 Distances in dimensions are multiplied by this value. The number of decimal places for the distance display. Round off the dimension to the nearest listed value. Text added before and after the dimension text. Prefix and suffix only display when the dimension text string contains "<>". Turn off the display of zeros at the beginning or end of the dimension. Display the second units in linear dimensions. Displays alternate units on the other side of the dimensions lines. Controls how the tolerance is formatted or displayed on the dimension line. Adds a ± (plus/minus) character and single Upper value. Displays the Upper value preceded by a + (plus) character and the Lower value preceded by a - (minus) character on the dimension line. Entering a negative number reverses the tolerance display from positive to negative and negative to positive. 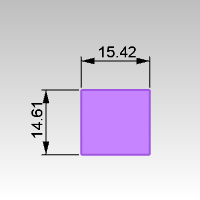 Displays the dimension length plus the Upper value and the dimension length minus the Lower value. Specifies the number of decimal places for the tolerance value. Specifies the number of decimal places for the tolerance value in the alternate units. Specifies the maximum or upper tolerance value. Specifies the minimum or lower tolerance value. Specifies the relative text height for the tolerance values. This setting is only for stacked types of tolerances.